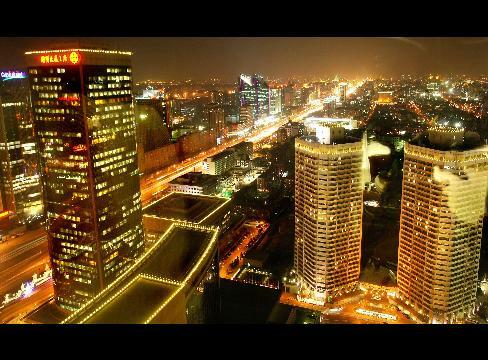 The above picture shows the illuminated sky touching buildings of China. All these tall buildings of china show the economic strength. But inside these building we find tremendous cracks which will break result to collapsing of the tall illuminated and well designed buildings. China has reported some key economic data’s which reflects the economy is growing and expansion is happening like any things in their industries. In this article we will try to find the invisible trend, analysis and foresight of such data’s. 4. Robust sales of Chinese automobiles. I hope this article will be able to clear some of the invisible facts of the above issues. New employment positions filled in China's urban areas hit 8.51 million in the first nine months of 2009, accounting for 94% of the government's target of 9 million for the whole year. During the first nine months, 4.02 million laid-off workers in China found new jobs, accounting for 80% of the government's target of 5 million for the whole year So when other economies specially the US and Europe is struggling to reduce the sky skapper rising unemployment china stand well ahead of these problems. China had attracted 52 billion U.S. dollars of investment over the past 30 years from the member states of the Association of Southeast Asian Nations (ASEAN), said an official with the China-ASEAN Business Council Wednesday. Increased flow of investments increases more the growth of the economy beyond any forecast of any economist. As of the end of 2008, the bilateral investment reached 60 billion U.S. dollars, of which the ASEAN investment in China was 52 billion, taking six percent of world's total investment in China. So recession times made china to act more quickly to capture more share of investments to their country. China's investments are spread unevenly around the world, with Asia, and especially Hong Kong, receiving the largest share. But much of this investment is a round musical chair game. Where we find that much more of these investments comes from through a foreign company that are then reinvested back into China as foreign capital, enabling the investor to take advantage of special tax incentives for foreign investment. Tax havens such as the Cayman Islands and British Virgin Islands also disguise where Chinese investments actually go. Figures reflect strong growth but in other words it’s a bubble which will last as long the game continues. Profits of China's state-owned enterprises (SOEs) fell 17.6 %year on year in the first nine months to 936.61 billion yuan (137.13 billion U.S. dollars), two percentage points lower compared with the Jan.-August period. Profits of central SOEs totaled 679.68 billion yuan from January to September, down 13 percent from a year earlier. Chinese over capacity have led to reduced demand and more supply. The later one has created the problem of reduced price sending the profitability of companies into tails spin. China over capacity is now a big burden. In my last article I well depicted the over capacity bubble of China. China is simply trying to dump its products to other countries and in the coming days many nations will complain to WTO for such activities. This over capacity production will simply reduce the competitiveness among Chinese industries, forcing them to sell below cost. Finally the loss bubble will enlarge more and in the coming quarters state-owned enterprises will incur much fall in its profits. An important barometer of China's foreign trade, the Canton Fair a strong rebound in foreign purchase and buyers compared with the last session in April, an encouraging sign of the country's export amid the continuing global recession. China Import and Export Fair from October 15 to 19 saw an export volume of about 15.6 billion U.S. dollars. That's up by 19.6% over the last session. Low pricing of Chinese goods as compared to other countries has increased this export figure. If the selling comparison have been made at par with other countries then it should have been extremely difficult to have the export growth according to this time. Low prices are enabling chin to sell the over capacity production and generating increased losses for the companies. In the coming years US automotive sector will face more bad days as china have taken over that space too. US auto sector is struggling along with other countries to have their well designed cars to be sold at the counters. According to the China Association of Automobile Manufacturers China's production of automobiles since the beginning of this year hit 10 million units on Tuesday, making it the third country in the world to surpass the annual output mark. When US auto along with European market was struggling for bailouts and other financial rebalancing china made a silent approach towards the market and increased its market share and filled the auto show rooms with their own brands. The government support package for the sector at the beginning of the year made all the difference. Reduced cost of borrowings and taxes made a win-win deal for China automotive sector. In the past only the United States and Japan have previously passed the annual production figure of 10 million. The country's auto output surged 78.85% year-on-year to 1.36 million units in September, while total sales hit a new monthly high of 1.33 million units, up 77.88% from a year earlier. But here also it will be interesting to watch that whether the increased sales have affected the profits of Chinese companies. Did they again sell at below cost? If so then another bubble in the wings for the automobile sector. Overall it can be said that as much the data’s are looking impressive the inner story depicts some thing different. Sales volume increased at the cost of companies profitability will be high cost game. Over capacity is ruining the Chinese factories and industries cash flow. This bubble will have a huge effect in the coming quarters which might send the China to another recession phase. The global market is struggling to revive where as china might send it further back into dark woods.